Classic cars tend to fall into two main categories; there are classic cars that have been kept in reasonable condition that can be restored to factory original condition and enjoyed as they would have been when originally purchased new; but there are also classic cars that have not been kept in reasonable condition and that are anything but complete, but which would make a perfect base for some “creative restoration”. Hot rodders have been engaged in what might be called “creative restoration” for at least half a century and counting. But there are those who want to create a car that is very much like the original, but with a modern engine and transmission and that is arguably a rather better car than the original. This re-built 1939 SS Jaguar complete with Chevrolet LT1 V8 engine and GM 700R4 automatic transmission is one of these. 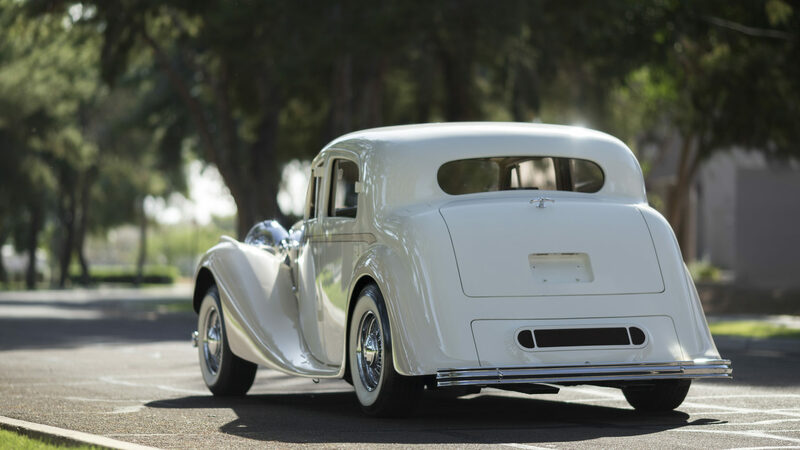 I may be called a “Philistine” for saying so but this 1939 SS Jaguar is the car Sir William Lyons would have built if he could have gotten supplies of Chevrolet’s LT1 V8 back in 1939. He couldn’t of course, so he installed the SS Jaguar with a 2½ liter Standard engine which had been tricked up by Harry Weslake so it put out 102hp. 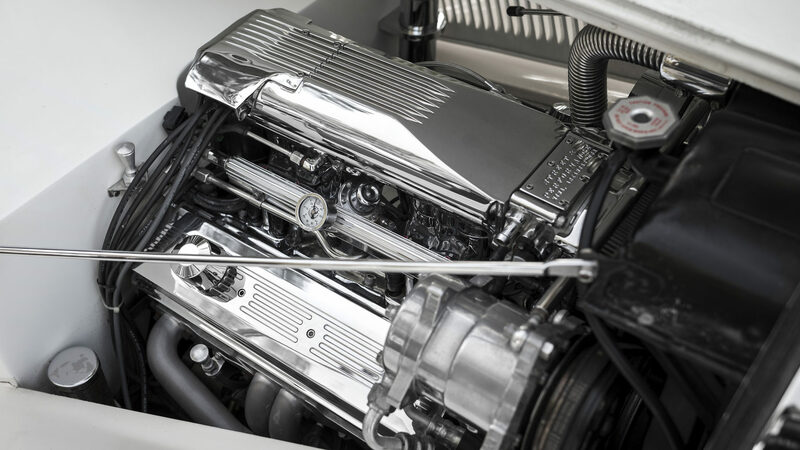 That was pretty impressive in 1939, but the Chevrolet Corvette LT1 installed in this SS Jaguar puts out 350hp from its 350 cubic inches which which would have been positively eyeball popping in the thirties and remains rather impressive here in the twenty-first century. Had the Chevrolet Corvette LT1 V8 been available to Sir William Lyons of SS Jaguar at an affordable price back in 1939 then I am sure he would have fitted it. Sir William Lyons who founded Jaguar Cars was a practical man who understood cars and car buyers rather better than most. He understood marketing as evidenced by his sales brochures being second to none. He understood the need for outstanding design, and for outstanding yet understated advertising long before Apple Corporation made their fortune using those same principles. In the post World War I period Sir William Lyons wanted to create cars that would look as stylish and luxurious as a Bentley or Lagonda but which could be had for a fraction of the money, and one of the most outstanding examples of his success in this was his SS Jaguar saloon that was put into production in 1935 until the outbreak of the Second World War in 1939, and then production would resume with the car now called the Jaguar from 1946-1948. Sir William Lyons understood style and he knew just how important the aesthetics of a car are both outside and inside. Sir William Lyons understood aesthetics, style, marketing and performance. He was the man who would be responsible for the creation of some of the most beautiful and most desirable motor cars the world has ever seen including the Jaguar XK120 and the E Type which so impressed Enzo Ferrari he described it as “The most beautiful car ever made”. 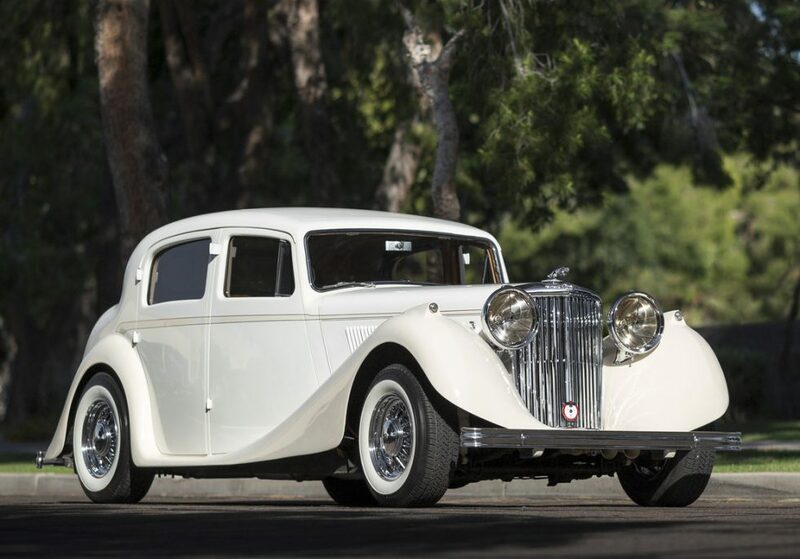 But before the outbreak of the Second World War which would see Hitler’s SS behaving so badly that after the war SS Cars would have to change their name Sir William Lyons was already making stunningly beautiful cars and selling them at very inexpensive prices. When you look at the outside of this SS Jaguar saloon you see a car that is easily as beautiful as a thirties Lagonda or Bentley. Its a car with the “presence” that Sir William’s designs all have. 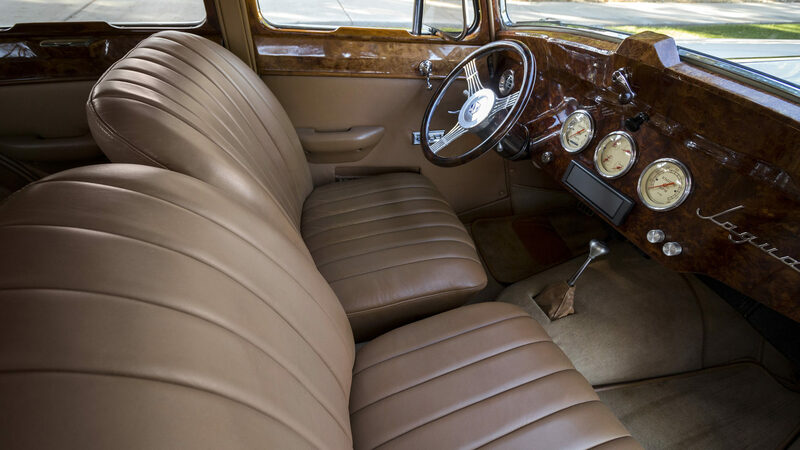 And when you climb inside and see the acres of luxurious wood that is reminiscent of the stock of a London “best gun”, and revel in the sumptious leather upholstery and plush carpet you know that is is a car that James Bond would rather have liked – but he had to settle for an ordinary Bentley that did not have a 350 cu. in. Chevvy V8 lurking under its hood making it into a suitable “Q car” for Commander Bond (which got their name from the Q ships of the World Wars). Looking like a preserved thirties Jaguar no-one is going to expect that there is a fire breathing, rubber burning 350hp V8 lurking under that svelte hood. 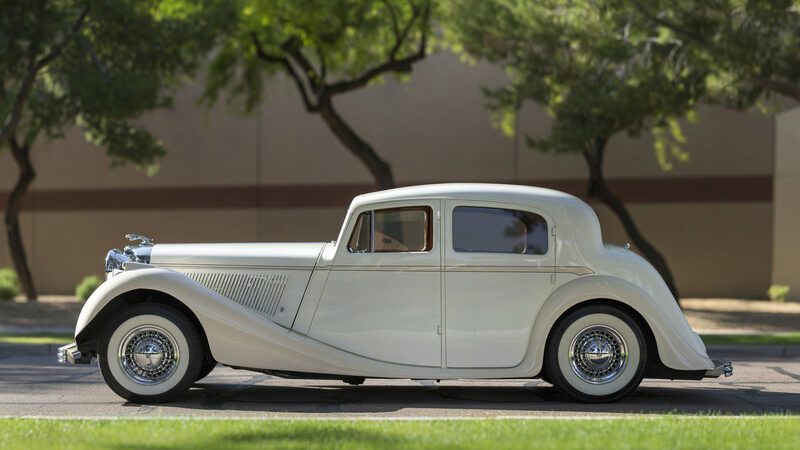 The gorgeous white SS Jaguar in our pictures is coming up for sale by Mecum Auctions at their Los Angles sale to be held between 17-18 February 2017. You will find the sale page for this unassumingly beautiful “Q car” if you click here. If you think you would be able to give a loving home to this air conditioned SS Jaguar that will leave most other cars standing at the lights as it accelerates away so fast it looks like its going into hyperspace drive then this one might just be for you.